Enter Stage Left, The Taming of the Shrew! Dr. Bloom played Petruchio – man about town, a swaggerly fellow determined to tame Kate. I played Kate, the shrew, (yes, it was type casting) and we were off. What a great change of pace this was. Comedy, at times, requires bigger physical gestures. We found this to be true of Taming of the Shrew. Dr. Bloom threw his hands up in the air on some lines, pronated (a particularly difficult position for his hands) on other lines and grabbed my arm after I pretended to slap him. Comedy also requires timing and timing requires listening to your fellow actor. In preparation for Taming of the Shrew, Dr. Bloom and I often warmed up with the Yes/No Exercise. We would say those simple words back and forth, trying to get the other person to agree. Whatever gesture and voice Dr. Bloom used to say “Yes,” I would use to say “No.” We whispered and yelled, slapped our thighs, shook our fists at the sky, and made silly faces at each other. Inevitably, one of us would end up saying the other person’s word. Fake opera singing is really awful to listen to, but really fun to do! So, we employed that tool in preparing for Petruchio and Kate. We enjoyed singing so much that we decided to add a song into our performance. 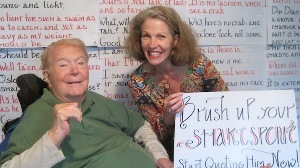 “Brush Up Your Shakesheare” comes from Kiss Me Kate, the musical version of Taming of the Shrew. Since Dr. Bloom is musical by nature, having grown up with piano lessons, the singing provided great vocal exercises and more humor. So, at our most recent performance, Hamlet fought with his mother. Richard III set his sights on the throne and murdered everyone in his way. But then Petruchio and Kate rolled in and duked in out in a battle of wits and words. The audience laughed. Dr. Bloom responded with more gestures and facial expression. He and I grew braver with our insults as Petruchio and Kate. We were funny! What a great intoxicating gift the laughter was. We had worked on our lines for so long, they were not funny to us anymore. and the women you will wow! Then he invited the audience to sing along and they did – beautifully! So, here lies the magic of theatre. It does not truly work until the performers and audience come together. Oscar Wilde wrote, “I regard theatre as the greatest of art forms, the most immediate way in which a human being can share with another the sense of what it is to be a human being.” Thank you, Mr. Wilde, for your quote, and thank you, Dr. Bloom, for making us all laugh! I’m so inspired by this and what the power of this art can do for movement. Thank you, Lori! Me, too! Hello Bob – the host with the most! Thank you! We will be back! I am so inspired by Dr Bloom’s regained mobility. If he can do it, I can do it! I want my therapy to be as fun as fun as they are having!